Do you know what ArcadeRoyal is? The slogan of ArcadeRoyal – which you are introduced to if you install it on Firefox – is “Get privileges to play royal games!” Needless to say, this program is supposed to provide you access to arcaderoyal.com games that you would not normally access without it. Well, if you install this browser extension, you will not only gain access to more games, but advertisements will appear as well. Due to this, we classify this extension as an advertising-supported program. In fact, we have seen quite a few different game managers that provide free games by flooding their users with online ads. FantastiGames, GamerHippo, and TerasGames are few of the many suspicious programs of this kind. Although these programs are not classified as the most dangerous, critical threats, eliminating them is important. If you want to learn why you should remove ArcadeRoyal, please continue reading. 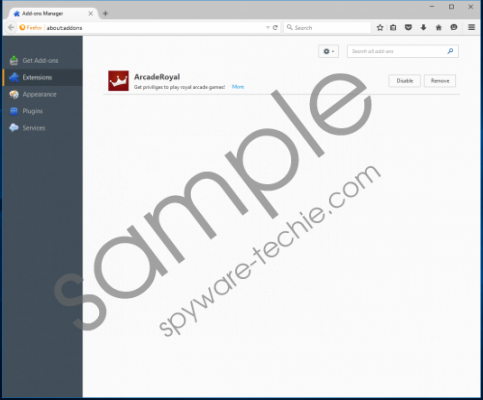 Our research team has found that ArcadeRoyal works with Mozilla Firefox and Internet Explorer web browsers; however, Chrome users might encounter this program as well. You will be required to install this extension when trying to play the so-called “Premium” games. It was found that this extension could also be downloaded via third-party installers. If you have installed this tool packaged with other programs, you need to scan your operating system immediately because you might have let in other suspicious programs as well. Note that malicious installers often use attractive programs to camouflage more dangerous, malicious infections. Hopefully, that is not the case, and you do not need to worry about the removal of additional infections or unreliable programs. If you find additional malware, do not panic, figure out which threats are the worst, and eliminate them first. If Trojans, rogues, keyloggers, or other malicious programs exist, the removal of ArcadeRoyal can wait. It is very important to choose the removal method that, ultimately, will guarantee success. If you choose to eliminate malicious programs manually without the right skills and knowledge, it is unlikely that you will succeed. Although we are sure that even inexperienced users can delete ArcadeRoyal manually, we are more worried about the third-party software that could be active on your PC. Depending on the malware that has entered your operating system, you might have to eliminate registry keys and multiple files. If you are not up for the challenge, employ automated malware detection and removal software. We suggest using this software even if you decide to use the instructions below. Uninstall the unwanted program if you have installed it for your Internet Explorer, and eliminate the leftovers. If this extension was installed for Firefox or Chrome, use the steps showing how to eliminate add-ons from them. Right-click the undesirable app and select Uninstall to eliminate it. Find the program you wish to eliminate, right-click it, and choose Uninstall. Click the Start icon on the Taskbar and open the Control Panel menu. Open the Add or Remove Programs menu and find adware. Enter %LOCALAPPDATA% or %UserProfile%\Local Settings\Application Data into the address bar. Open the arcaderoyal.com folder and Delete aryu.exe (uninstaller). Launch the browser and tap Ctrl+Shift+A to access the Add-ons Manager. Select More tools and click Extensions to access the chrome://extensions/ menu. Click the recycle bin button next to the undesirable extension and choose Remove. ArcadeRoyal is a suspicious extension that enables potentially unreliable ads to show up when you are browsing the web. We strongly recommend eliminating this ad-supported program from your operating system because it might open up security backdoors that could be exploited by unreliable parties. If this adware has entered your operating system packaged with other infections, we suggest employing a malware remover to have all threats erased simultaneously. If this adware is the only unwanted piece of software, use the instructions above. In either case, do not forget to implement reliable security software to ensure that malicious programs cannot attack in the future. Tags: ArcadeRoyal, delete ArcadeRoyal, remove ArcadeRoyal.